Cornerstones is very excited to offer our richly illustrated guide, which is acknowledged as the best source for expert, field-tested information on the care and maintenance of historic adobe buildings—from small vernacular structures to the great Spanish Colonial missions. As a true “how-to” manual, it presents a user-friendly and straightforward approach to the assessment, maintenance, preservation and restoration of earthen buildings based on traditional techniques and methods. The purchase price for Adobe Conservation is $34.95, plus tax and shipping. To order, contact Cornerstones Community Partnerships at 505-982-9521 or email Karen Kuranz at kkuranz@cstones.org. 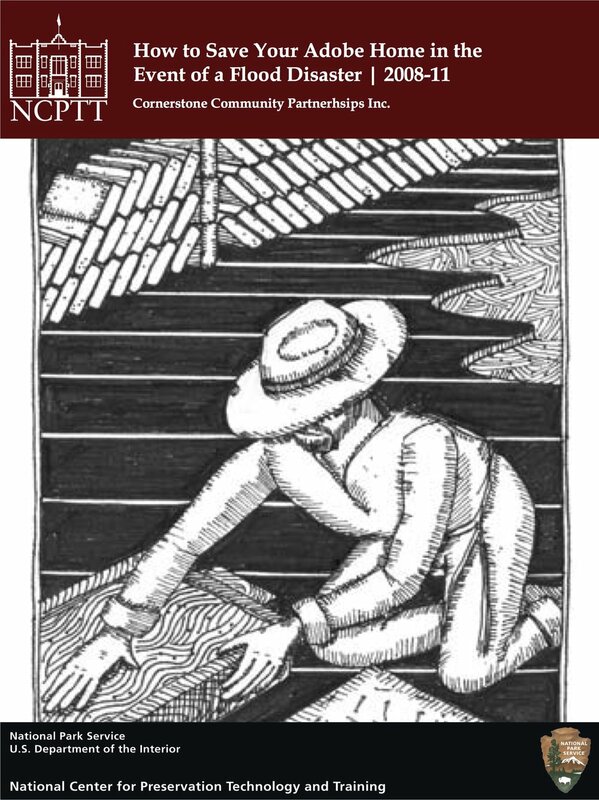 The bilingual (English and Spanish) manual is the result of Cornerstones’ emergency response to homeowners in Hatch, NM when monsoons of 2006 resulted in extremely destructive flooding, causing extensive water damage to nearly 400 adobe homes, most of which dated to the early 20th century. Two to three feet of water filled homes, which submerged the adobe walls for 48 to 72 hours and acted as an accelerator that produced a wall deterioration rate that normally occurs in adobe houses over several decades, not days. The manual provides a much more favorable alternative to tearing down flood-damaged homes and having residents live in temporary housing until structures are rebuilt. The materials used to compile the manual are time-tested and based on decades of combined adobe experience. Cornerstones’ technical staff has worked with Mexico’s Instituto Nacional de Anthrolopologie e Historia, the International Council on Monuments and Sites, New Mexico State Monuments, the State Historic Preservation Office, the National Park Service and communities throughout the Southwest to preserve historic earthen architecture. The manual is a practical, visual resource with illustrations of procedures and techniques. Specifically, the manual addresses the materials and methods that will result in a successful restoration of flood-damaged adobe structures, such as mold mitigation and wall base repairs. This manual was made possible through Grant MT-2210-07-NC-03 from the National Center for Preservation Technology and Training (NCPTT). This manual is available for $10.00, shipping and handling. Limited quantities. Please call 505-982-8521 to order your copy.